As our reading habits changed, so did the way we read books. We brought in new ways of reading, in our devices apart from just the old systems. We now have apps running on our smartphones which are capable of doing almost anything. Of course, reading eBooks was one of them too. You just have to get some eBooks ( either in RTF, PDF, Epub or Mobi ) and load them up on your device. Once you do that, you just have to install eBook reading apps from Google Play Store. Of the many reading apps that you have on the play store, the easiest to use is Moon reader. 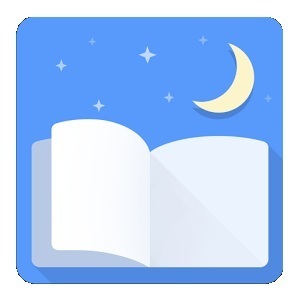 During this article, we’ll see as to why Moon reader takes the front face in leading up the list of Android e-reading apps. Let’s look at the features of this reader. With this app on your device, you don’t have any other. We say this because, Moon reader can view, open and read, almost any type of book format which you have on your device. Be it PDF, Epub, Mobi, Doc, or any other; you can always get to read them in this app. Of course, most of the eBook reading apps support multiple formats, but none support all. You can practically read everything here. The official newsletter that we can see from the website tells us the following points. 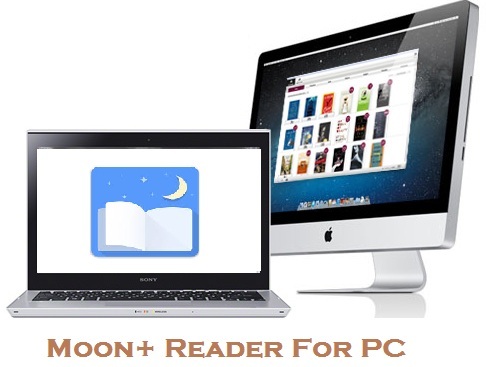 Moon reader lends support to Epub, Pdf, Mobi, Chm, CBR, Umd, Fb2, Txt, Html, Rar, Zip or OPDS. What the above list implies is that you can open anything that concerns text in it. You no longer have to install different device app for opening different files. Having the above points in mind, we can see that reader will begin all and any. However, you may lose out on the web page experience of reading an eBook. After all, Moon Reader works best when you load an eBook for it. You have a decent enough eBook reader with you. Now all you need to do is spend your hours reading. For this, you need access to almost any type of book. Libraries are the best way of doing it. There are many free libraries out on the web, which will help you get almost any type of eBook out there. Thus, all you have to do is sync your Moon app to these libraries by having an account in them. If you are in need of some free libraries some of our best picks are – FreeBookSpot, ManyBooks, Scribd, SnipFiles, etc. For a good list of websites from where you can get ebooks for free, refer to the link given. Load up your Calibre app on your smartphone. Allow it to load up and then click on Preferences. You will find this button on the top bar. As soon as you do so, a separate window will open up with a Start Server message appearing on screen. After this click on Test Server, in the following window. Here you will have to be careful in noting down the URL of the web page that opens up. This you will need in connecting the Calibre server to Moon Reader library tools. Once you’ve noted it down, you may exit the Calibre tool. Now fire up your Moon reader app in the same device. Within this reader, you shall have to click on “Online Library” tool and further tap on “Add New Catalogue.” Here you need to input the URL that you recorded in the previous step. Now, once you’ve saved the preferences, you may have to restart the application to see that the linking is done perfectly. Now, you can access your Calibre server for all the eBooks you need. Then in Moon Reader “Online Library” tab, click “Add new catalogue…”, input this URL, restart the reader to access your Calibre server. The most common feature that you can see within using Moon on your Smart device is pinching to zoom. This is a default function you have on any Android device. You may have seen this while viewing pictures mostly. Also, you can search and find your books easily, by drawing an alphabet. As simple as that. As with most video players these days in Smartphones, you can tap and drag on the corners of your device to change volume or brightness. Sliding up the finger increases the intensity and sliding down decreases it. Of course, sometimes you may have to change the display modes in your Moon reader. Most users do this as they have to adjust to their surroundings. For example, if it’s night time, you may double tap on the screen to change into Night Mode (white fonts on black background) On the contrary if you are outside in the sun, you may want the opposite of Night more. For single viewing, without straining your eyes is Sepia. You can access these features from settings and tools as well. With using Moon Reader, you get some exciting features which you cannot find anywhere else. You get total control over anything that you want to read. Apparently, this means that you can pull up specific styles for each element of your text. Be it fonts, colour overlays, themes, etc. However, these aren’t the best features we are going to discuss here. The following are some cool new features of Moon reader which will make you install it on your device instantly. We already know that you can load up multiple books into this eBook reading app. Also, in PC readers, this is rare to achieve. However, when you take a look at how easily we can define and change the way we read the books, the excitement is always there. 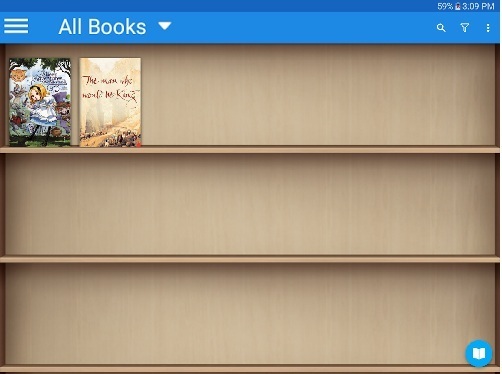 You can link libraries quickly to the app as shown above, and get your books here. In addition to this, with Moon Pro version purchase, you can directly link Google Drive and DropBox accounts. Next time you need a book that you want to read, it’s already there. You just have to drop them into Google Drive or Dropbox, and Moon reader gets them for you. Thus, cloud services help you in never losing out on your books. Are you wondering if you can sync the bookshelf as well? The answer is yes. You may have to buy the premier version of Moon Reader, to register it for an account. Now when you install the app across various devices, see to it that you use this same account. Under this account then, all your books and reading habits get saved. You can access them from anywhere and pick up where you left off. Indeed a great feature and a highly useful one too. You can use Moon Reader to modify the fonts from your Android device. The sentence is assuming you have a device which supports the loading of multiple. fonts quickly. However, if you are using this reading app in PC, for your eBooks, there is no problem at all. 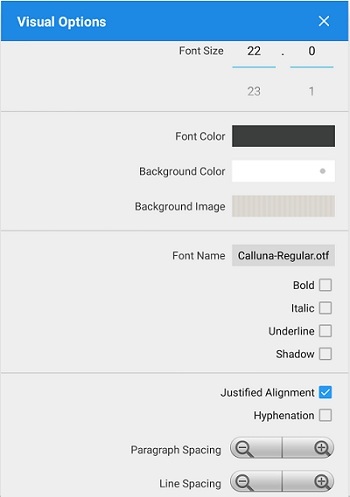 The app automatically analyzes the system for available fonts and load them up on the device. You can then scroll and select. Moon reader supports most of the fonts, except for a few here and there. You may face a real problem when you try to use this reader to read books which are in Eastern scripts. Remember that Arabic book you genuinely liked but couldn’t open up on your device. Well, that’s where Moon reader shines. With a little bit of tweaking and installing, you can go ahead and open any book quickly. The process is simple. Load up the fonts on your device and let the reader do its job. Sometimes, you may have to restart the app after installing the new fonts and asking it analyse the fonts directory. It will take some time and come up with support for these fonts. Now you can read the scripts in any way you want. Screen display options include a seamless full screen. You have a slick information bar which hardly appears as a disturbance if you are using a larger screen (5.5 Inches) for reading the app. Though it is very sleek (almost to the point of transparency), it still displays useful information like battery percentage, current time, chapter name, etc. Also, like in Kindle devices, you can always get back and check your progress with the bar slider at the bottom of the page. That makes your life easy when you want to go back a few chapters and refer to something you found interesting. The official new letter reads 24 customised operations (screen click, swipe gesture, hardware keys), apply to 15 customised events: search, bookmark, themes, navigation, font size and more. This means that you can bookmark (through a swipe of a finger), themes (like dark gothic, etc. to customise each book ), font sizes and much more. Now as we can see from the above, you can customise not only the internal gestures but also hardware keys like volume buttons, home buttons, etc.reader, to do some tasks. You can define them by going to the settings and control preferences within the tab options you see. All control for you. Moon reader always tries to be this minimalist, clean interface which allows for easy search and read across the device. When you tap the centre of the screen, you get the top and bottom bars. Most of the icons on the bottom bar are self-explanatory, but there are a few things you may have to find out for yourself. This gives your eBook reading the highest preference. You may read the eBooks which you so want, without any disturbance. You get the options back when you click or tap. In addition to this, you may keep the screen awake permanently as this will allow you to use gestures for tweaking the reading experience. Scroll effects that you can try for your reading pleasure are almost five different types. Of them, the main types of doing it are blind mode; by pixel, by line or by page. Real-time speed control. You can understand these features briefly as Blind Mode is for visually impaired where the app reads out the text. Of the rest, line-by-line draws out one line after another after a fixed time (usually just seconds between them). This is similar to Page wise scroll effect as well, as you can go one after the another. Usually, this is what we do while reading an ePub file. 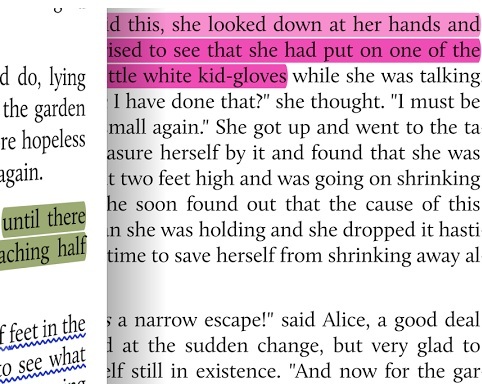 Similarly, Pixel-wise is making the text you are reading into a highlight so that you focus is not on other sentences. Also, you can activate an automatic tool which goes by “Keep Your Eyes Healthy” which reminds you to look away, reduces the brightness, or theme. You can select this option if you want the app to remember that you are reading for a relatively long time without giving your eyes rest. This feature helps you to read for longer times than usual. Oh did I mention that you can even get the soft key light off while you are reading? Also with some tweaks, you can disable notifications as well. Other Graphical tools that the makers have brought out in Moon Reader are Intelligent paragraph; indent paragraph; trim unwanted blank spaces options. You must be wondering what these are? Don’t fret. These are the features that ensure that you never miss out on the reading experience even if you are in horizontal and vertical modes. The app intelligently adjusts the paragraphs and arranges the items instantly. Adjustment means that your screen is changed quickly by the app, and you never lose out on the quality of the text. After all, you need to keep your eyes healthy, and that’s what this app believes in. We aren’t done with the incredible features that you find with Reader. You need to check out, Real page turning effect with customised speed/colour/transparent; 5-page flip animations. Now you can get a real page-turning experience. This way it feels like you are reading a physical book. A nice little touch in making the experience much more involving. Also, a curtain-type page flip, really makes it great to look at. 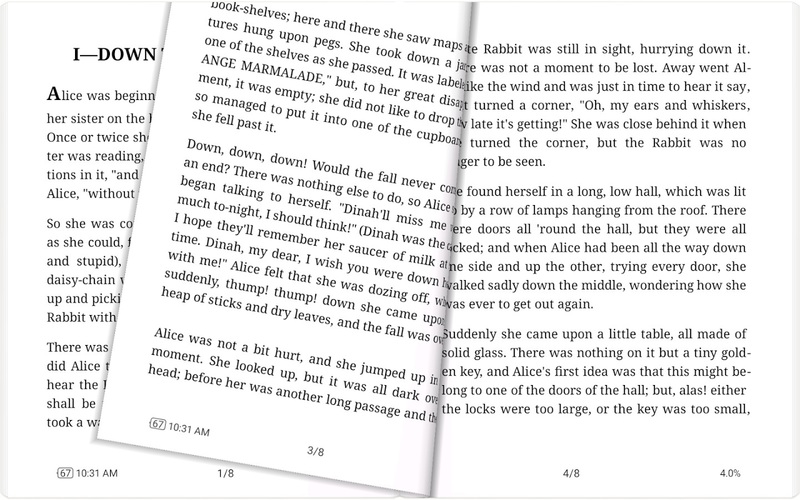 Some of the other features which make a greater value to reading are – Dual page mode for landscape screen. Also, Highlight, Annotation, Dictionary (Offline or Online, support ColorDict, GoldenDict, Fora, ABBYY Lingvo, etc. ), Translation, Share functions all in this ebook reader. Thus, you have almost all the fantastic things you want for an eBook. As we already know here, Moon reader can get its books from various sources. Usually, you can load up books from SD Card, Internal drives, and downloads, etc. However, if you are going for a premium version of Moon Reader, you can sync your Google Drive and Dropbox to Moon Reader and get your books to appear instantly within the device. Now the exciting thing with Moon Reader is the way it arranges its books into BookShelf. You can define and make your bookshelf as you wish with your books and the meta tags that are available. In this respect, you can sort out the books in the form of Favourites (the books that you come to regularly), Downloads (those you have in your internal storage), etc. These are the destination or source based sorting. However, you can also arrange Authors, Tags, Self Book cover, etc. Thus, you can have books organise intuitively and logically. Apart from this, you can edit and update self-book cover, use search for getting your book, etc. All in all, you can get the books to appear and feel as you want them to. Never miss out on any book you want from different sources like Online libraries, and free download sites. Moon reader offers many great features which help you read your eBook quickly. And it’s all about the experience you get from it. Go ahead and try it. Now the question is that, even though you have Moon reader with you, you still need books which are worthy of it. They need to be well made, laden with the highest quality of typesetting features and so on. Therefore, you need to have a professional publishing services company which can give your business the right platform and method to release your book. It will bring your book to appear in the best way possible. We are a well-reputed book publishing company which takes pride in providing top of the class book publishing services in digital format. Drop us a mail, and we can take it forward from there. Happy reading.